For the filling, we veganized this recipe from The Kitchn. Salsa, guacamole, etc for serving. Melt the Earth Balance and mix together with the spices and shredded jackfruit. 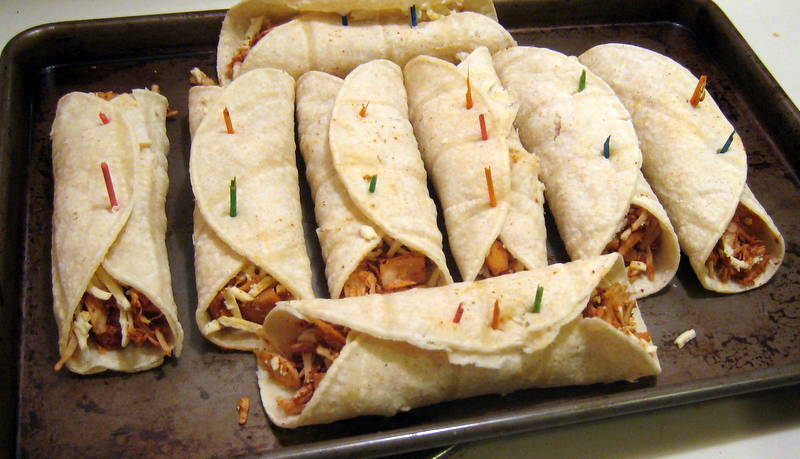 Fill each tortilla with 3 TBL of jackfruit and some Daiya, then roll up and hold together with wooden toothpicks. Brush with olive oil. Bake 10-15 minutes, until golden. Whisk together sour cream (or yogurt) with lime juice. 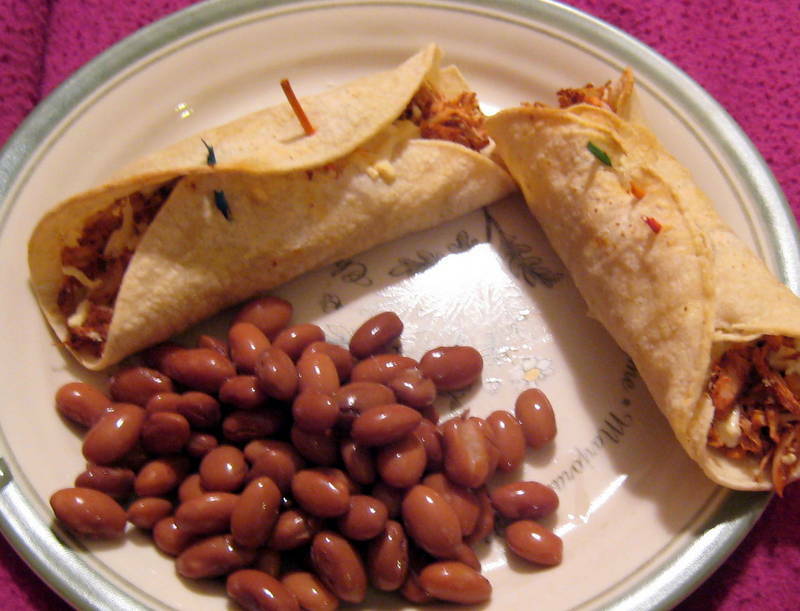 Serve with beans, guacamole salad, and lime sour cream for dipping. As bloggers, we do a lot of research to come up with new, interesting items to eat and share. When we saw this “ginger beer pulled pork“, it seemed like the perfect recipe to veganize this month. It’s different than our beloved Carolina barbecue with the added cumin and the ginger beer flavor. Serve on a pita or soft rolls, and don’t forget a tangy slaw. Rinse and squeeze the jackfruit. Add jackfruit and rinsed/drained beans to a dutch oven. Add spices and coat the “BBQ”. Add onions, mustard, apple cider vinegar, ketchup, Worchestershire sauce, ginger, and ginger beer and bring to a boil. Cover and cook on medium-low for 1.5-2 hours. Stir occasionally. Add more water if needed. The jackfruit should be very tender. When you’re done cooking, pull the jackfruit apart with a spoon. 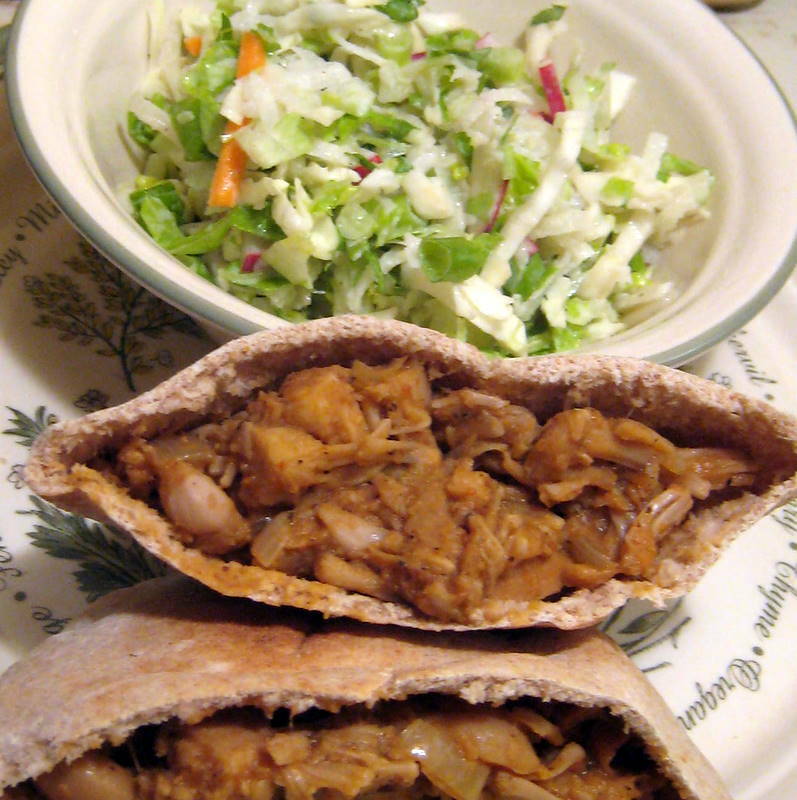 Edit: We ate the slaw in the pita with bbq, drizzled with lots of tahini. Edit 2: This was good, but Carolina bbq is better. still the jackfruit was an awesome bbq “meat”. We’ll definitely use it again.